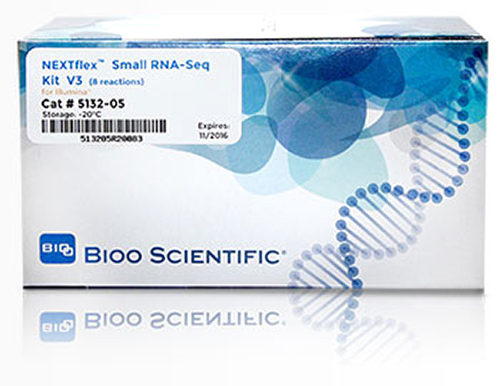 The NEXTflex™ Small RNA-Seq Kit v3 improves small RNA analysis by making the library prep protocol completely gel-free or allowing for low-input small RNA library preparation. This kit also reduces the biases associated with small RNA sequencing by using patent-pending randomized adapter technology, resulting in small RNA libraries with more accurate sequencing data and a dramatic reduction in bias. This new kit allows the gel size selection step to be replaced with a bead purification step with input of 200 ng to 2 µg total RNA or purified small RNA from 200 ng to 10 µg total RNA. This method also facilitates small RNA library prep from input as low as 5 ng of total RNA. Additionally, the NEXTflex Small RNA-Seq Library Prep Kit incorporates randomized adapter technology to reduce bias introduced during the ligation step of library prep.